ADVERT: It is essential to have at least 1 power BOT assigned in your room for the correct configuration of bot. 1. You must put your ID or Regname in box and press "Change owner". Click for example. 2. You must enter the name of your chat (NOT THE LINK). Click for example. 3. You must configure the power BOT with the ID 1510151. 5. Your configuration is complete, the bot should appear in minutes. If not, contact our staff at Arcbot xat. There must be at least 1 owner or main owner present in the room for the correct confirmation of the bot after its configuration. To confirm it, use the command "!confirmbot" Click for example. 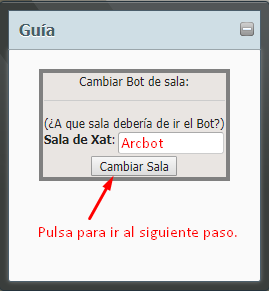 If the xat is only for "member" users, the bot must receive that rank or higher as soon as it is incorporated. My bot does not arrive. What can I do? If your bot does not arrive we will personally take care to tell you what is the error, so we will need you to go to https://xat.com/Arcbot and explain the problem so we can resolve it as soon as possible. My bot does not give the message to confirm it. What happens? 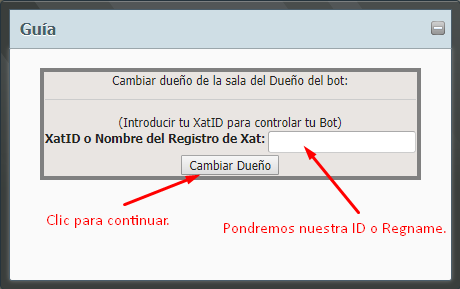 It is very possible that your xat is only for members, so it will be necessary for the bot to receive a member or higher rank. If the bot is still not responding, please go to https://xat.com/Arcbot and explain the problem so we can resolve it as soon as possible.